On a sunny day McKay Miller brought an umbrella to keep the sun from disturbing his walk. Logan City Parks have made some great progress on its trails this season. 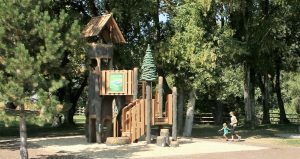 They just finished installing a new playground at the west end of the Trapper Park Trail for an additional attraction and recently completed a connecting trail from the Riverwalk Trail to Rendezvous Park. 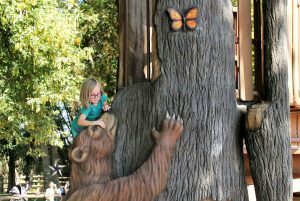 Five year-old Hanna Penrod climbs on the playground equipment recently finished at the west end of Trapper Park Trail. Logan Mayor, Holly Daines, said she is pleased with the progress the city has made on the city trail system over the last six years. Ed Stevens, Logan City Park’s superintendent, said even before the trail was finished, people were using it. 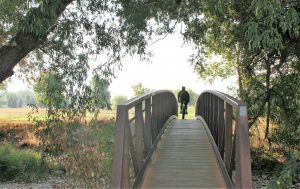 “The Logan River Walk Trail, by the (Logan River) Golf Course, is probably one of the most-used trails in the system,” he said. He said they have two full-time people working on the trails, and some seasonal workers during the summer to work on the trails. Erica Penrod and her daughter Hanna run over to the recently-completed playground equipment at Trapper Trail Park. The Trapper Park Trail was recently connected to the River Walk Trail. There are 26 different trails maintained in and around Logan City. Half of the trails are under one mile in length, the longest trail at this point is the 1000 North trail. It is listed on the Logan City Trail Guide as 3.3 miles long. Mayor Daines is no stranger to the trail system, she walks them and watches others as they enjoy the scenery and fruits of the city’s Parks and Recreation Department. “They are also free for users, require no special equipment, and are good for people of all ages,” she said. The mayor said she enjoys seeing people walking, running, pushing strollers, riding bikes, and walking dogs on the trails. “On some of our trail sections, I even see folks in motorized scooters, and I’ve pushed my mom in her wheelchair,” she said. She reminded dog owners that pets need to be on a leash while on the trails, and owners are asked to clean up after them. Dogipot Stations with clean-up bags have been set up throughout the trail system. There are three different trail types within the system. There are paved and shared-use trails, made of concrete or asphalt, designated for multiple users including bikers, strollers, skaters, walkers, and runners. Logan City has paved and shared-use trails, made of concrete or asphalt, designated for multiple users including bikers, strollers, skaters, walkers, and runners. The unpaved trails are for more advanced users who like to walk, run or bike. And last, of course, are the sidewalks adjacent to the streets that are also included in the system. All Logan City Parks and Trails are closed from sunset to sunrise by ordinance. Vehicles of any kind are prohibited in any park after dark unless there is a special activity approved by the city. Anything tied to a tree is prohibited, especially slacklines and hammocks, according to a city ordinance. Damaging trees by carving, breaking, removing or transplanting is also unlawful by city ordinance. The latest section of trails the city is working on is between First Dam and Utah State University. Daines says it is expected to be completed next summer.